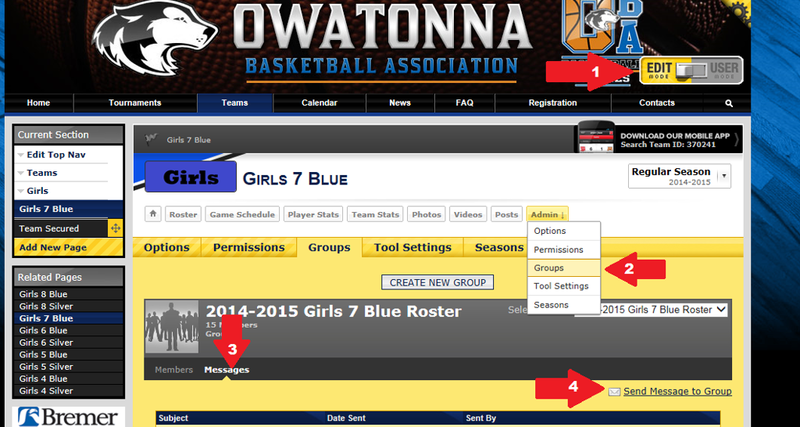 Any scheduling changes, conflicts, or questions should be sent to our scheduler at OwatonnaBasketball@gmail.com. It's very important that you contact us in advance if you are not going to use your reserved practice time. Please inform our Scheduler, Miranda Dibble, at OwatonnaBasketball@gmail.com if you are going to alter your practice schedule. This allows OBA to best utilize our court resources. OBA will be charged by the school district for unused gym space that we have booked, so it's important to communicate changes as soon as you know them. Coaches, Parent Reps, and OBA Board Members have permission to change team calendars. Login to the OBA website with your Sport Ngin account. Click the Edit Mode/User Mode toggle switch in the upper right corner of the page. A gear will now appear above the list of Calendar events. Click the gear to get a popup menu, then click "Add Event". On the "Add New Event" window, you must provide an Event Name (i.e. "Practice"), specify the correct time, and location is helpful. Click the "Create This Event" button at the bottom. Your event is now added to the team calendar. Click the link to the event you wish to Edit or Delete. The Event will be displayed on your browser. Use the gear to Edit or Delete as necessary. The information collected for each player (i.e. phone numbers, emails, etc.) is available on a "Team Secured" web page under each team. Only the coaches and parent reps should have access to that page. The Team Secured page has an element with player name, parent name, phone number and email(s). Clicking the Details link for a play will display all the registration data. You can also click the Export CSV link to create an Excel document with the data. To see the master schedule, simply click the Teams navigation option on the website. Then click the View All at the bottom of the All Team Upcoming Events element. This will populate the calendar with all scheduled team events. Please post your game scores on the website. 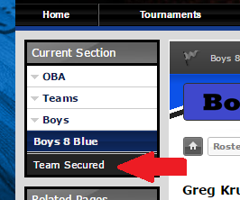 Coaches, Parent Reps, and OBA Board members have permissions to update the team pages, which include Games and Stats. To enter Game scores, you must login to the website and get to the game via the ticker tape on the home page or via your team page. When you are viewing the game information, enter Edit Mode (this looks like a toggle switch in the upper right corner of the website). Once in Edit Mode, you can enter the score via a Quick Score button or enter Stats. If you wish to record stastics, there is some setup work involved. The Sport Ngin help has information on how to do this. You can choose which statistics categories to maintain. For each game, the stats can be entered for each player. The mobile app can also be used to enter scores and stats. Contact Red if you have questions. If you are unable to update your game scores, feel free to text or email Red to make updates. The roster on each team page contains the list of team players. Those players are also tied to a Sport Ngin account with their parents email address when they registered. Through the website you can send emails to the entire team. One benefit of this email solution is the families have flexibility to add/remove/change email addresses for their Sport Ngin account without having to tell Coaches to change their distribution list. The system will automatically send the email the address(es) tied to their account. Coaches (and Parent Reps) are granted "Owner" permissions to their team sites. With that permission you will see an Edit Mode/User Mode toggle switch in the upper right corner of the website now. Coaches are considered part of the roster, so if you chose to send to ALL members, the coach(es) will receive the email too. The screen shot below indicates the steps needed to send a team email. Select the "Groups" option under the Admin button. Click the "Send Message to Group" link on the right side. The "Select Message Recipients" screen will appear. Here select "All" to email the entire team. On the next screen be sure to provide a Subject of your email as well as a descriptive message in the Body. Click the "Send Message" button at the bottom when you are ready to send.